With the remarkable Choi-Liang Lin as soloist rediscovering in Dun's imitations of the traditional Chinese fiddle the Taiwanese heritage he himself left behind as a child, this performance has an intensity and magic that stays in the mind long after it is over. Es sind spannungsreiche, ja fesselnde Interpretationen, die auf dieser CD zu hören sind. This is probably one of the most remarkable productions of contemporary music of the year. Un disque idéal pour découvrir l'univers de Tan Dun. This CD contains three works by Chinese composer Tan Dun, performed by the Helsinki Philharmonic Orchestra under the direction of Muhai Tang. 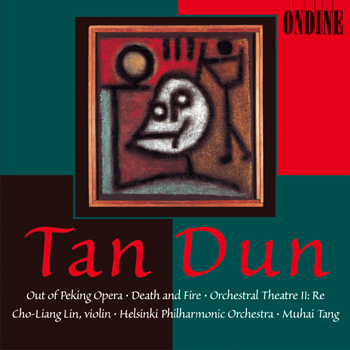 The première recording of the one-movement piece for violin and orchestra "Out of Peking Opera" (1987, rev. 1994) features Choi-Liang Lin as soloist. Death and Fire (1983, rev. 1992) is Tan Dun's artistic response to Paul Klee exhibition at New York's Museum of Modern Art - a dialogue between composer and painter. Orchestral Theatre II: Re (1992) for a divided orchestra, bass voice, and audience with two conductors, employs the orchestra and audience members as joint participants in the performance with the inclusion of singing, movement, and the playing of ancient Chinese instruments.